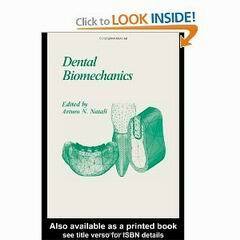 Dental Biomechanics PDF Download Ebook. Arturo N. Natali provides a comprehensive, timely, and wide-reaching survey of the relevant aspects of biomechanical investigation within the dental field. Leading the reader through the mechanical analysis of dental problems in dental implants, orthodontics, and natural tooth mechanics, this book covers an increasingly important and popular subject area. Arturo N. Natali is full Professor of Industrial Bioengineering at Faculty of Engineering, University of Padova. Author of papers pertaining to the mechanics of biological materials, with particular regard to the formulation of numerical methods addressed to the analysis of biomechanical behaviour of hard and soft tissues. It also addresses a number of contemporary discussions including hard and soft tissue mechanics, relief procedures using computer tomography, evaluation of image processing techniques, and pre-surgical activity, dental materials relating to implants, titanium cast devices, metallurgic problems and implant surface treatments. There are topics on mechanical testing procedures for reliability evaluation of dental devices, relevant aspects of clinical practice with reference to biomechanical problems and orthodontic treatments in relation to the mechanical characteristics of orthodontic appliances. This book also explains numerical modeling in dental biomechanics, highlighting the relevance of this approach for the investigation of dental problems and mechanics of materials. This text will be of interest to all bioengineers and clinicians with its presentation of a multidisciplinary approach to dental biomechanics based on mechanical, clinical, and chemical-physical knowledge.